Surprise Surprise ... Just in time for the holidays ... SKINNY BODY MAX!!! The first new product is an extra potent weight loss pill called SKINNY BODY MAX and it sounds like Skinny Fiber on steroids (see video and ingredients list below). Skinny Body max is for customers who need a little more impact for metabolism, fat and weight loss. This product is for pre-order now and will ship out at the beginning of December. The second new product is an amazing night time weight loss formula called HIBURN8, so make sure to keep your eyes out for it by mid December. HiBurn8 is a weight management product that you can take with Skinny Fiber or Skinny Body Max to have 24 /7 weight loss support. It has health and weight loss benefits for the 7 - 8 hours it helps you sleep! Available at the end of Jan 2016. The third new product is called INSTANT YOUTH and is a compliment to our Ageless Anti-Aging Serum and it is called Instant Youth. It is a highly effective Instant Wrinkle Eraser to help with the "immediate gratification" that we all desire in a modern skin care product. Watch a video and go over the ingredients in this all natural product by clicking the Instant Youth link above! I am super excited to share with you all of the information on the very first of these INCREDIBLE new products called SKINNY BODY MAX ... "The next generation of Healthy Weight Loss!" CHECK OUT THE DETAILS BELOW! CLICK HERE to learn about the ingredients, benefits, side effects, pricing and specials, as well as how to buy Skinny Body Max online today! 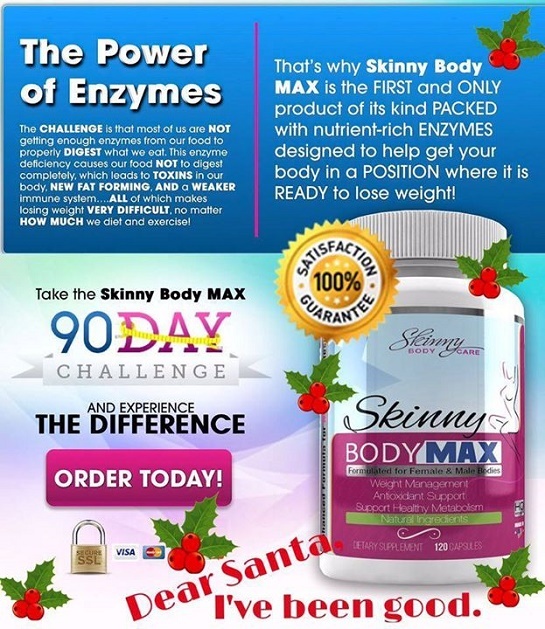 Does Skinny Body Max Replace Skinny Fiber? NO, Skinny Body Max does not replace Skinny Fiber. Skinny Fiber is all natural supplement with fibers,enzymes and NO STIMULANTS. It is still available to buy on this website!!!! Skinny Fiber is the company's AWARD WINNING product because it's worked for so many people over the years, so it's not going anywhere, but Skinny Body Max is an updated product for healthy men and women who want or need a little more kick for weight loss plus the advantage of other health benefits of a combined prebiotic, probiotic and fat burner. We hope you love it!!! I will add more information on Skinny Body Max as it becomes available. As always, please feel free to Contact Me with questions, follow along on this blog and on Facebook page. Please make sure to bookmark this page or click one of the share buttons at the bottom of this post, so you can save this information to your Facebook, Google+, Pinterest or other site. This way you have it for when you are ready to order (or as a hint for your hubby this Christmas). Hugs & Blessings to you!! !